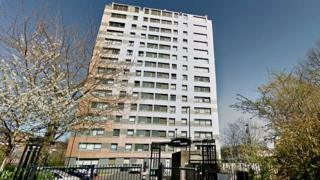 The removal of cladding from 20 tower blocks in Salford has been halted due to "unclear" government advice, two social housing providers have said. Salix Homes and City West Housing Trust have both stopped work despite samples failing government fire safety tests. Tests were ordered on cladding from about 600 blocks in England after the Grenfell Tower fire on 14 June. The government said its "advice is clear" and it has appointed a dedicated caseworker to monitor progress. Cladding is typically fitted to the outside of high-rise buildings to improve their insulation and appearance. Of 191 samples of aluminium composite material (ACM) panels submitted by 51 authorities across England, 190 have failed combustibility tests. These include 16 in Manchester, 12 in Eccles, and nine in Pendleton and eight in Salford. Salix Homes began removing cladding from its Salford high-rise blocks on 26 June - Arthur Millwood Canon Hussey and Blackfriars Courts as well as Mulberry, Magnolia and Sycamore Courts and Newbank and Riverbank Towers. It has used aluminium panels as a temporary replacement. Sue Sutton from the group said it has now stopped because advice is "now unclear and there is conflicting information about the need to remove the panels." City West Housing Trust has also suspended the removal of ACM panels and affected cladding from 12 tower blocks in Eccles. "This will remain the case until we have clearer guidance on the kinds of panels we can use as a replacement and we are certain that removing the affected panels is the best and safest option," said a spokesman. After testing, landlords and fire services should jointly "take decisions on building safety", a Department for Communities and Local Government spokesman said. "On top of this, we have appointed a dedicated caseworker to liaise directly with the local authority to ensure they have access to all the current advice and to maintain a dialogue on the progress being made." The government has said cladding samples which failed safety tests in the wake of the fire will be subjected to further "large-scale" testing. A spokeswoman for Pendleton Together said the group is continuing to remove cladding on the nine blocks it manages for Salford Council.